Complete your scrub uniform with unisex scrub pants in a size that fits you. The drawstring waist on these scrub pants allows you to control the fit. Many unisex scrub pants have convenient pockets, and you can choose between blue, green, raspberry and navy colors. Shop our wide selection of comfortable unisex scrub pants here at Walgreens.com. 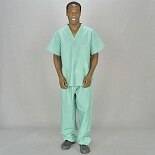 The generously cut quality construction of most medical scrub pants allows them to withstand frequent wear and washing. You can match your unisex scrub pants with solid color scrub tops or printed ladies scrub tops in cheerful patterns. You can also find scrub jackets and white lab coats to round out your professional wardrobe. If you're looking for other home medical equipment, you can find wound care and cleansing products among other supplies. Cleansing products range from no rinse shampoo and body wash to surface disinfectants & cleaners. There are also creams, lotions & balms and personal cleansing cloths. Wound care includes post surgical dressings such as surgical sponges and wound and catheter dressings, as well as dressings to treat pressure/bed sores. Shop our equipment area for monitoring devices such as digital thermometers, stethoscopes and sphygmomanometers.